Get 30-Year Celebration Discounts Now ... See Details Below. Course Contents . . . Whether it's decades ago (above) or today, Burge's timeless ear training secrets work for musicians of all ages, instruments and styles. You will receive five (5) graduated Relative Pitch ear training LEVELS, a grand total of 41 three-quarter hour personalized Power Lessons with David Lucas Burge on 41 Audio CDs plus written Notes for each Level. No music note reading skills required. You'll learn to UNDERSTAND and SPEAK the LANGUAGE OF MUSIC  all BY EAR. You'll learn how to compose all possible kinds of chords  then NAME all chords by EAR ALONE. You'll learn musical intervals, cadences, inversions, scales, compound intervals, and countless other essentials  all to build up your virtuoso ear for music. The further you progress with your Relative Pitch ear training, the more you will hear  and the more interesting the Lessons become. When you graduate Level 5, you will have full (and permanent) development of your Relative Pitch. 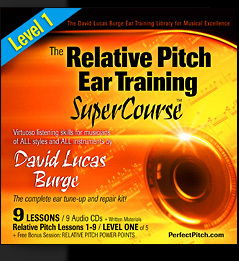 Please begin your Relative Pitch Ear Training SuperCourse with Level 1, Lesson 1. This unique audio series offers you a highly enjoyable and specialized progression of Relative Pitch ear training with David Lucas Burge. Therefore, it's important to start at the very beginning. Maybe you already have Relative Pitch, and you'd like to do some routine maintenance  retune your ear, correct any deficiencies  to keep your ear running smoothly. Maybe you are the newest beginner who is starting from point zero. Maybe you're somewhere in between. Wherever you place yourself, it is essential that you begin with Level 1, Lesson 1, and listen to each Lesson in its PROPER SEQUENCE. You will learn powerful techniques in Levels 1, 2, and 3 that you will use throughout the Course. When you listen in this way  step by step  you are assured to receive Burge's complete Relative Pitch ear training tune-up  with the permanent benefits that we guarantee. 2 Exam Procedures (3:35) / 3 Level One Exam, Section 1: Spelling Test (5:04) / 4 Section 2: Relative Pitch Identification (7:15) / 5 Section 3: Interval Singing (6:14) / 6 Section 4: Lightning Round (7:09) / 7 Section 5: Synthesizer Lightning Round: Part 1 (5:46) / 8 Part 2 (3:56) / 9 More Exam Procedures (:47) / 10 Conclusion of Level One (3:35) / 11 Bonus Session: RELATIVE PITCH POWER POINTS / 12 Listen to these Power Points at any time you need support. You have upgraded your ear with a complete Relative Pitch tune-up. 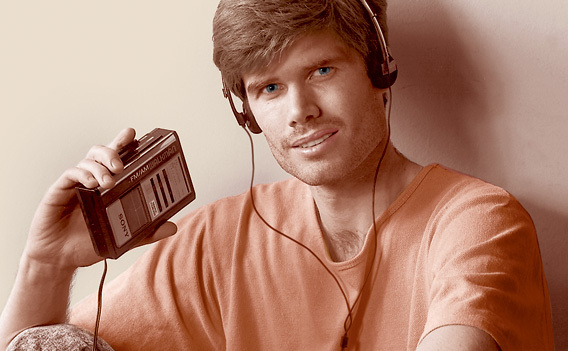 You now possess the virtuoso listening skills of Established Relative Pitch. Learn to understand and speak the language of music with Relative Pitch (see details below). David Lucas Burge's unique Ear Training Methods for all Musicians.